Individual retirement accounts (IRAs) are great vehicles for investing in retirement. However, as with anything the government creates, they don’t always make it easy to navigate the ins and outs of the product. If you currently have an IRA, or are thinking about starting to invest in an IRA, make sure that you don’t do these things! When you open an IRA, you usually name a beneficiary. This is the person who will inherit the IRA upon your death. If you are just opening an IRA and you are young, you may skip this step. Don’t! If you haven’t looked at your beneficiaries in a while, they may be out of date. Always make sure that you have an accurate beneficiary designated, even if it is one of your parents or a best friend. Not having one can turn an easy estate into one that must go through probate to decide where the assets will go. Also, never name a trust or other entity the beneficiary of an IRA. If you do, it will automatically lose all the benefits of being in an IRA (tax deferral, etc.). One of the best aspects of an IRA is the tax deferral that is incorporated into the vehicle. You may be wondering why this is a problem. 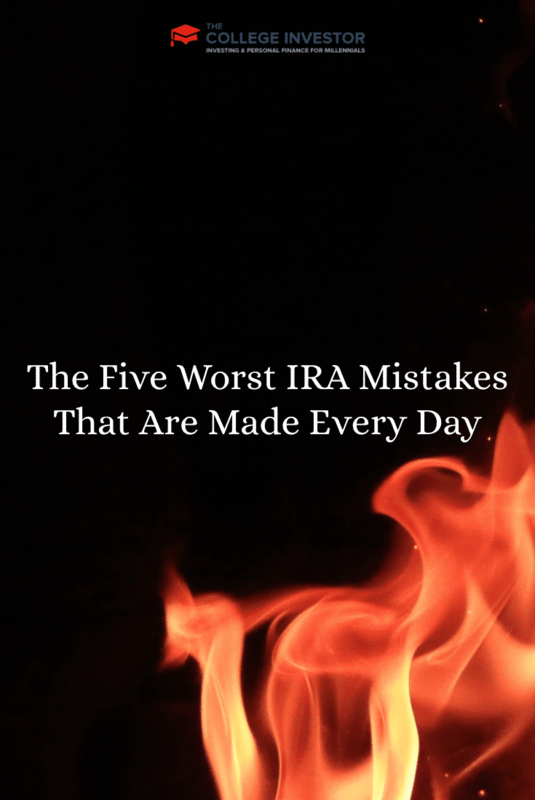 It can become a problem if you have the wrong investments inside an IRA. You want to avoid investments that are already tax-deferred, such as municipal bonds or insurance products. Having these in an IRA really negates the purpose of having a tax-deferred vehicle. These products should be held outside an IRA, while investments in an IRA should take advantage of the tax-deferred nature of the account. Another big mistake that a lot of investors make is holding their IRAs at a bank. Many banks try to “sell” IRAs to their customers as a way to build loyalty. However, banks, by their nature, do not allow the diversity of investments that holding an IRA at a brokerage would allow. In fact, many banks only offer structured products and loaded mutual funds to be held in IRAs. Some banks do have separate brokerages which they are affiliated with. For example, Wells Fargo bank is affiliated with Wells Fargo Advisors. In this case, your IRA would be held with the brokerage, and you would have access to all investment products. When starting an IRA, it is important to start it at a discount brokerage that doesn’t charge fees for the account, and offers a broad range of free and no-load funds. You can find my favorite cheap investing sites here. If you currently have an IRA and pay fees or are not happy with your selection of investments, it is very simple to move over to a new brokerage. It takes maybe five minutes of paperwork, and your account can be moved in about seven days. Perhaps the worst mistake you can make is not taking advantage of an IRA or Roth IRA altogether. Maybe you have been waiting. Maybe the current market has left you unsettled and you don’t want to start something new. It is important to remember that an IRA is just a vehicle. Within it, you can invest in all kinds of financial products. If you don’t want to invest in stocks currently, you can invest in CDs or bonds. The same rules apply in that all your income generated from these products is tax-deferred. If you qualify for a Roth IRA, definitely do not pass up the opportunity. This account differs in that you use after-tax money to fund it, but everything you withdraw after age 59 1/2 is tax-free! Don’t be caught making these simple IRA mistakes and save some money! Readers, what other common investing mistakes do people make with their IRAs? I read about the tax deferral problem a lot. It seems that people must not have a complete grasp on that or I wouldn’t keep seeing it over and over. All excellent points Robert! I can’t stress enough on the setting up the beneficiary. Very easy to postpone or overlook but could turn out to be a very costly mistake. Numerous horror stories of Exes reaping the benefits of an IRA because the beneficiary information wasn’t changed! My issue with Sharebuilder is the cost to buy and sell. If you are only investing $100/month it is 4%. If you are investing more, you would be better off investing at Fidelity or Vanguard and not get the fees for investing. Very good article. Well written and important to consider factors. Also, don’t take out money from an IRA and pay a 10% penalty. That’s really a bad decision (unless you have no other alternative). Barb – Great point, but you can always withdraw your principal without penalty. Robert, that is only with a Roth IRA and only after the account has been open for 5 years. When I worked at a broker-dealer, we had several customers who did not name a beneficiary for an account when they first set it up. It was really hard to tell them that unfortunately, we could not release the funds without the owner’s signature or legal death certified paperwork. That’s not exactly what you want to hear when your relative is on their death bed. Moral of the story: Name a beneficiary for every account you own! Even if you have a will, it will make things easier for the company you bank/broker with. I’m still fairly young and just recently set up a 401(k) through my employer. With that, an emergency fund, and a savings account for major purchases (car/home/etc. ), I don’t exactly have a ton of money leftover to put in a Roth. I’d really like to start once I have a bit more leeway with my expenses. @Jason – with a firm like T. Rowe Price, they let you invest a minimum of $50/month. (You have to keep putting in $50/month until you have $1,000 – if you skip a month before then, they’ll just cash out your account and send you a check.) But if you can spare $50/month, you can start an IRA. I started with that, until I got comfortable having $50/month less to spend, then upped it to $100/month… etc. @Robert – good point about the bank! I started my Roth IRA at bank of america, and I assumed I would be able to invest in stocks, since I knew they have Banc of America (their investment branch). Not the case! It was really through the bank, and the only option I had was a money market! I rolled it over to T. Rowe Price pretty easily though. I just updated my beneficiaries listed on my account. Good thing I did, since I opened it before I was married and still in college. I had an IRA with Bank of America for 40 years . I went in to cash it out and they said they turned it over to unclaimed funds . However unclaimed funds did not have it . I lost $30.000 . 00 . Evidently there was a clause iniated and I was not notified . Horrible way to be treated at 64 years of age . They stole from me . I never received a letter of any sort stating that I was in jeopardy of losing that money . I still have notices from 1997 . How shameful and horrible that is for Bank of America to treat old people like that . If you have statements, you should file a complaint with the SIPC. You should also contact your state attorney general and provide the evidence and demand to know what happened to your money.